A fine powdery substance obtained by milling wheat with application in farinaceous foods. Whole-wheat flour is a powdery substance, a basic food ingredient, derived by grinding or mashing the whole grain of wheat, also known as the wheatberry. Whole-wheat flour is used in baking of breads and other baked goods, and also typically mixed with other lighter "white" unbleached or bleached flours to restore nutrients to the white flours, texture, and body that are lost in milling and other processing to the finished baked goods or other food. Whole-grain whole wheat flour is a full-flavored flour containing vitamins, minerals and protein. Whole-grain whole wheat flour is more nutritious than refined white flour, although white flour may, in a process called food fortification, have some micronutrients lost in processing added back to the white flour. 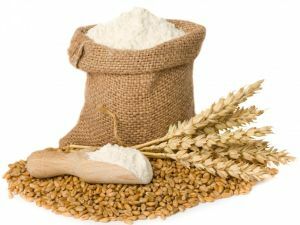 Fortified white wheat flour does not, however, contain the macronutrients of the wheat's bran and germ like whole-grain flour does, and is notably lacking in fiber. Whole grain is a good source of calcium, iron, fiber, and other minerals like selenium. 1. Wheat is most commonly ground into flour for use in the baking of breads; it is also eaten as a porridge-type cereal. Other nutritive uses of wheat includes pasta, made from flour and eggs. 2. Wheat is the major ingredient in most breads, rolls, crackers, cookies, biscuits, cakes, doughnuts, muffins, pancakes, waffles, noodles, piecrusts, ice cream cones, macaroni, spaghetti, puddings, pizza, and many prepared hot and cold breakfast foods. 3. Much of the wheat used for livestock and poultry feed is a by-product of the flour milling industry. 4. Wheat straw is used for livestock bedding. The green forage may be grazed by livestock or used as hay or silage. In many areas of the southern Great Plains, wheat serves a dual purpose by being grazed in the fall and early spring and then harvested as a grain crop. 1. Besides being a high carbohydrate food, wheat contains valuable protein, minerals, and vitamins. Wheat is an efficient source of protein, when balanced by other foods that supply certain amino acids such as lysine. 2. Vitamin E found in it, is a powerful antioxidant when it comes to skin health and beauty. Its boosts immunity and has anti-aging properties and can prevent heart diseases and even cancer. 3. It contains octacosonal which improves mental agility and alertness.